There are many misconceptions when it comes to food – for instance, what shelf items need to be refrigerated after opening. It’s no wonder people have questions with so many different foods to prep, cook and store! Whether you are new to the kitchen or have curiosities when it comes to food, we have answers to 6 common cooking and food prep questions. The common belief is that adding salt to water helps it boil faster, but salt actually increases the boiling point of water. The reason you want to salt your water is to add flavor to what you’ll be cooking. For instance, the taste of pasta is enhanced when it absorbs salted water. When grains are packed together, they can develop a starchy coating. Rinsing your grains before cooking removes this surface layer, so you don’t end up with an extra sticky texture. Quinoa has an outer coating called saponin that produces a bitter taste if not rinsed. You may think rinsing raw chicken is a good measure to prevent foodborne illness, but oven roasting chicken to a safe internal temperature will kill any bacteria. In fact, you run the risk of spreading bacteria to your sink and surrounding counters by rinsing raw poultry. There’s nothing better than fresh, handpicked vegetables from the farmer’s market but frozen and canned vegetables are also safe to eat. Unfortunately, we don’t know how long fresh vegetables have been on display in the supermarket, so frozen varieties could be a better option. Frozen vegetables are picked when fresh and sealed at this peak stage. 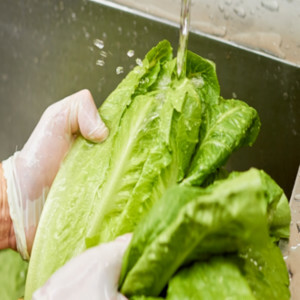 Heads of lettuce – especially the unwrapped ones – can sometimes look dirty on the surface. It’s perfectly acceptable to remove these outer leaves, but a quick rinse under water will wash away exterior dirt and bacteria. How Long Can Food Be Left Out? The answer to this question depends on the type of food. According to the USDA, cooked food should not be left out at room temperature for more than two hours. At this point, bacteria starts to grow rapidly and could be unsafe to eat by the time you store it away. On the other hand, most raw fruits are safe to keep unrefrigerated. After a long day, your cooking and food prep questions can be overwhelming. To enjoy a homecooked meal with your family, come to Colony Diner & Restaurant in Wallingford! We serve breakfast, lunch and dinner 7 days a week and all holidays. Is Breakfast the Most Important Meal? What Are The Benefits Of a Vegan Diet?